King Henry VIII accomplished many great things during his reign as King of England. With everything that he accomplished, one might assume that he didn't have any free time for gambling, but we will quickly find out just how wrong those assumptions are. During the turn of the sixteenth century, when King Henry VIII took the throne, gambling was becoming quite popular in England. King Henry VIII, also known as England's #1 gambler, enjoyed gambling in its many forms from betting on sporting events to playing dice and card games against his friends. King Henry VIII was born on June 28th, 1491 to King Henry VII of England and Elizabeth of York. He grew up in the palace with his three siblings: his brother, Arthur, King of Whales and his two sisters, Mary and Margaret. King Henry VIII had always been overshadowed by his brother Arthur, who was the true heir to the throne. Even though he wasn't going to be King, his duties started very early in life when at the age of two, Henry was appointed Constable of Dover Castle and at age three he was appointed Earl Marshal of England and Lord Lieutenant of Ireland. In addition to his new titles, Henry was provided with the very best education by specialized teachers and professionals. He quickly became fluent in both Latin and French, also excelling in math and astronomy as well. His brother, Arthur, died at age 15 and the cause of death to this day still remains unknown. Arthur was planning to marry Catherine of Aragon prior to his death, and to remain in good standing with Spain, King Henry VIII took her hand in marriage and later became the new heir to his father's throne. Henry's mother also passed away around the same time as his brother's death, leaving the family in a state of distraught. King Henry VII was in no condition to raise his children on his own, and he took his anger out on Henry, constantly reminding him that he never would be the true heir. Henry's view of his father became known when he took over as King and reversed many of his father's policies and executed most of his trusted servants. His rash decisions, aggressive personality, and his desire for change were traits he carried throughout all aspects of his life. King Henry VIII reigned for almost four decades over which he accomplished many great things for the country of England. He established the Church of England, remodeled England's government and taxation laws, and incorporated Wales into England's system of local administration. In addition to that, he was behind the establishment of many colleges, fortresses, and other palaces. He helped Ireland establish their kingdom and contributed to a new focus on the importance of Parliament for England. Henry became head of the Church of England, breaking away from the Roman Catholic Church so that he could divorce Catherine of Aragon and marry Jane Seymour. King Henry VIII married six different women over the course of his reign, replacing or killing them if they were unable to bare him a son. He had his first legitimate son with Jane Seymour in 1537, who later became known as King Edward VI of England. When he came to the throne, a new game emerged to the streets of London called, "Bragg," a three-card game that many people speculate poker derived from. Along with that, the most popular games during that time were queek: a checkers based game and Fox & Geese: a game of pursuit. King Henry VIII enjoyed those games as well playing an older version of backgammon called, "Tables." The King also took part in many betting and gambling events open to the public. He used to bet on archery and jousting tournaments, some of which he also competed in. King Henry VIII went on a two year losing streak in which he accumulated a total loss of £3,250, which was a significant amount of money for that time period. The most surprising risk he took though was when he bet and lost the Jesus bells of the old St. Paul Church over a single toss of the dice. To defend his actions, he gave no merit to the bells, claiming they were merely a piece of metal that holds little value. Sir Miles Partridge won the bells, but soon after he received them, King Henry VIII convicted him of treason, and he was hanged at Tower Hill for everyone to see. Although he banned his army from gambling so that they could focus on reconquering parts of France, he never prosecuted any of the London bookmakers as he worked closely with them to place his bets. Also, during court sessions with Parliament, King Henry VIII was known for disputing any claims against gambling. 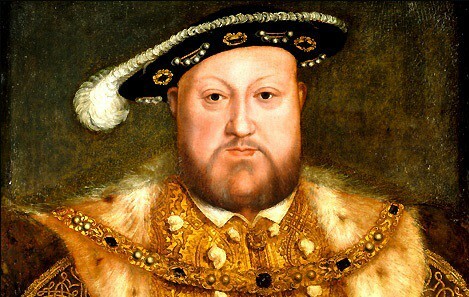 King Henry VIII died in January of 1547 at age 55. Toward the end of his life, he lost a desire for physical activity and continued to indulge himself with all the delicious foods his palace had to offer. Needless to say, Henry reached a very unhealthy weight. His actual cause of death is still left a mystery for many. Some people speculate that he may have developed type II diabetes as a result of his poor lifestyle choices, while others say he suffered from the gout. His body was buried in St. George's Chapel in Windsor Castle, next to his previous wife Jane Seymour.